An Army site currently used for bomb disposal work is being sold so 5,000 new homes can be built in Medway. The 1,000-acre site in Chattenden is currently used by the Royal School of Military Engineering (RSME) to teach soldiers how to find and defuse bombs. 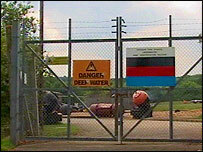 The Defence Explosive Ordnance Disposal School and National Search Centre will be moved to Oxfordshire, the MoD said. It means housing growth in Medway will be kept to previously developed, brownfield land, the council said. Medway director of regeneration Robin Cooper said: "About a third of the housing we'll be building in Medway will be on the Chattenden site. "Had that not gone ahead it would have opened the floodgates for developers to look at the green areas of Medway. "We're now confident that with places like Chatham, Rochester, Strood and Chattenden that we can develop our housing on brownfield or previously-used sites. "So this decision today is absolutely crucial for Medway." Announcing the move, Under Secretary of State for Defence Derek Twigg said money from the sale would be invested into the RSME.